My sheep hunting buddy and I have thoroughly put to use a Big Agnes Copper Spur 3 on our sheep hunts together. It’s been a proven early season performer, and even stood up to some unexpected weather. However, despite working, a few of those windstorms had us wondering if a tougher tent would be a better option. A later than usual sheep hunt in new territory exposed us to colder weather and more snow than previous hunts. This, combined with some separate pursuits later in the season, had us searching for a burlier option. 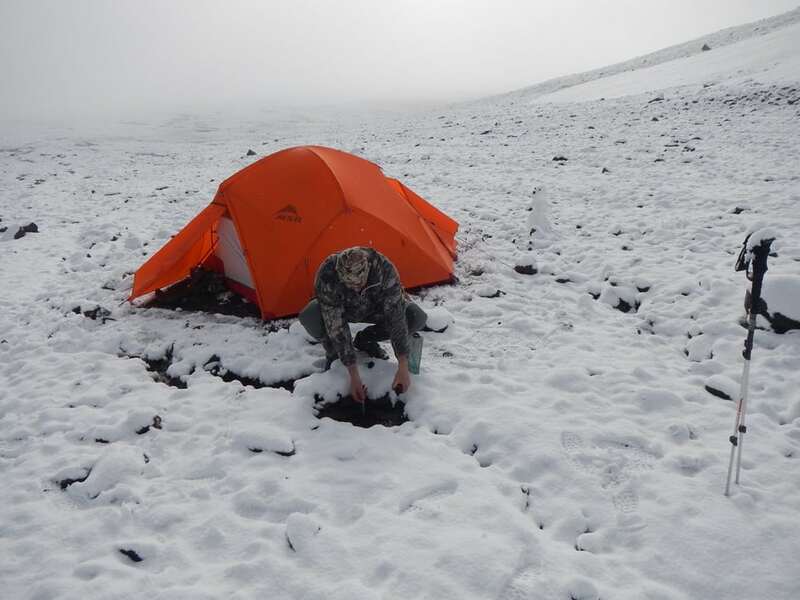 Our goal was to find a tent that could handle high winds, cold weather, and a snow load. Something the Big Agnes was not rated for. Finding a tent that is both lightweight and durable can be very challenging. Some hunters prefer one man tents and use tarps for gear storage, others use open floor concepts. We have found we prefer to run one tent that suits both two hunters and gear. Our requirements include having two doors and two vestibules, fast easy setup, and a rainfly that comes down to the ground. We had run a few different tents over the past years with mixed results. Our biggest challenges were that we didn’t trust the durability of the tent in extreme weather, the design allowed cold air to come into the tent, or it had too small of an interior space. Our goal was to reduce wind inside the tent, and thus create a warmer sleeping environment. 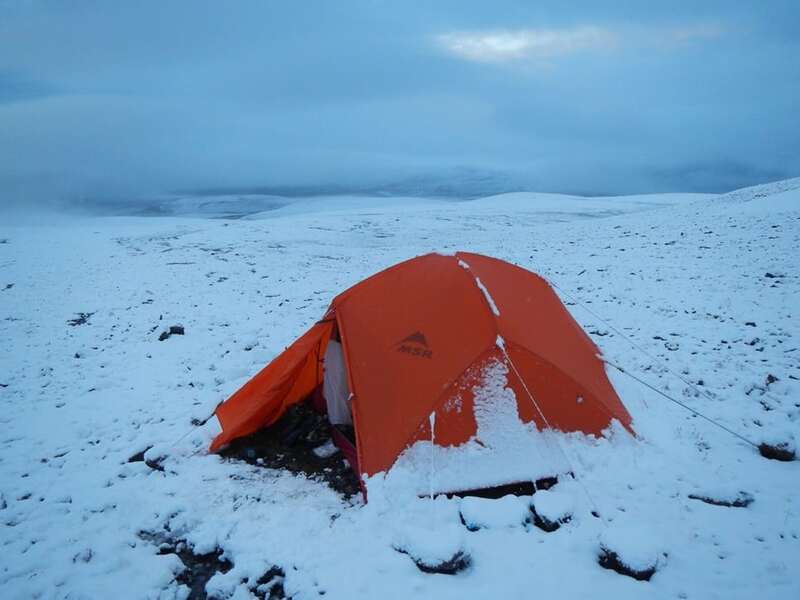 Our other concern was the tent’s combined ability to handle high winds and a snow load. Our research led us to the MSR Access 3 (link here). The MSR Access 3 is a three-person, four season tent designed for backcountry ski touring. There are not many tents that meet the specifications we had, and even better it weighed in at just over 5lbs. While the MSR Access 3 met our requirements on paper, it was time to get some field time in and see how it actually performed. A weekend test was conducted in Alaska. It was done in January with temperatures in the single digits and in snowy conditions. Initial impressions were that the tent was of high quality, and set up was an easy task. The tent comes with two simple poles and could be done by one person, even with gloves on. The main pole is a one-piece contraption that connects together to form a vertical backbone, with two Ys at each end that go down to the four corners. The second pole goes across the tent to add stability and help frame up the two doors. 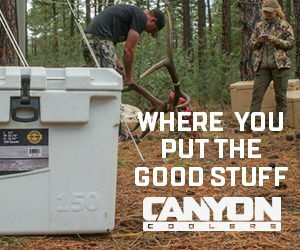 The tent body connects to the poles via 14 plastic clips that are simple and easy to use. The tent comes with eight stakes, but as we used more than the standard guy lines, 12-14 stakes are recommended. Condensation was not an issue, and it seemed to sleep as warm as a tent could in those conditions. 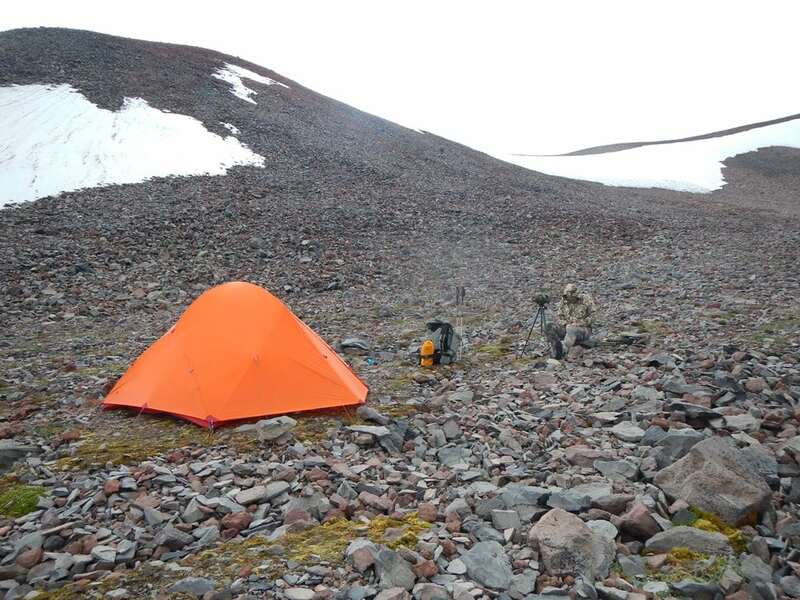 Between the four us, the tent was used on two different sheep hunts in varied weather. Luckily for us, the weather was nasty enough to really test the tent. The longest test was a nine-day run in the Wrangle Mountains of Alaska. Using the Access 3 in daily rain, hail, wind and snow really helped us frame up our overall take on the tent. In sheep hunting, the weather is everything, and more than one hunt has been limited due to weather. While this greatly affects one’s ability to punch a tag, it makes for an ideal gear testing environment. If you have ever spent much time in the mountains of Alaska you know that feeling when you can hear the wind heading your way. We estimated 60 plus mile per hour winds came roaring up the valley. The winds were strong enough that they would slam into the tent and collapse it down. As soon as the wind slowed, it would pop back up. We were impressed with the Easton Syclone poles’ ability to bend, but not break. The 20D rip-stop nylon rainfly with 1200mm Durashield did a fantastic job of keeping the interior dry in the daily rain, hail, and snow. The poles and tent also stood up well to light snow loads. Field time proved it was a warmer tent than the Big Agnes, and it survived high winds with a higher level of confidence, especially when properly tied down (more on that to follow). The 41 square feet of interior space was perfect for two sheep hunters. We would not recommend this as a 3 person tent, more of a two-plus sort of setup. It did have more headroom (47”) than our other tents did, and campers could sit up without their heads hitting the roof. All in all, the tent was durable and functional. With that said the tent does have a few things we’d like to see changed. Most tents we have used utilize Velcro on the rainfly that allows you to center the fly to the tent poles. With previous tents, these Velcro ties help keep the rainfly positioned properly. 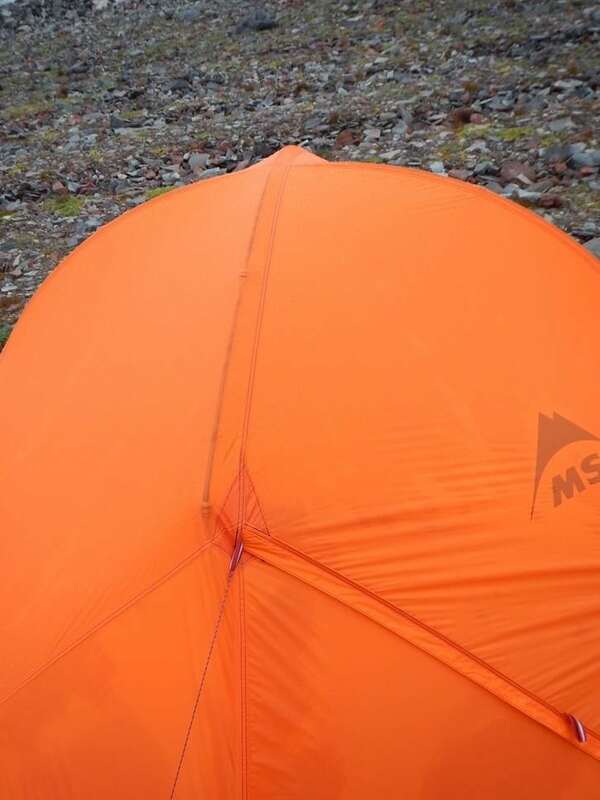 Unfortunately the MSR Access 3 did not have this option and this caused the rainfly to shift across the tent more than we would have liked, and required extra diligence in how you staked the tent out. No matter how tight we had the tent staked out; it would slip from the wind, rain, or snow. It was a problem that we were never able to find a good remedy for. Another thing we had to change was the number of guy lines. The tent seemed to come with the minimal amount but thankfully had multiple spots on the rainfly to add your own. The lack of guylines allowed the rainfly to sag down and touch the interior tent body. Condensation would then drip through the tent onto the lucky occupants. We loaded it up with extra guy lines and this was critical to keeping the fly positioned properly. Attaching more guylines also helped the tent to hold up better, and not collapse as far in the wind. Be sure to either do this prior to using the tent or bring extra guylines to work through this challenge in the field. 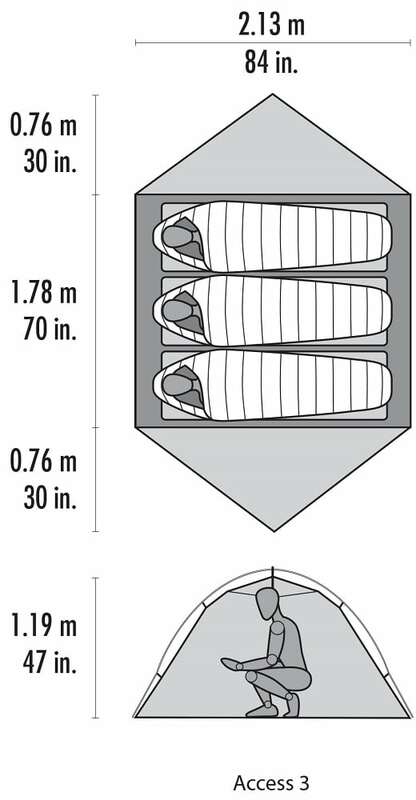 While we liked that the tent had two vestibules, they were a bit smaller than other tents at 17.5 square feet. It would have been nice to have a little more space, especially when hunkered down in bad weather. 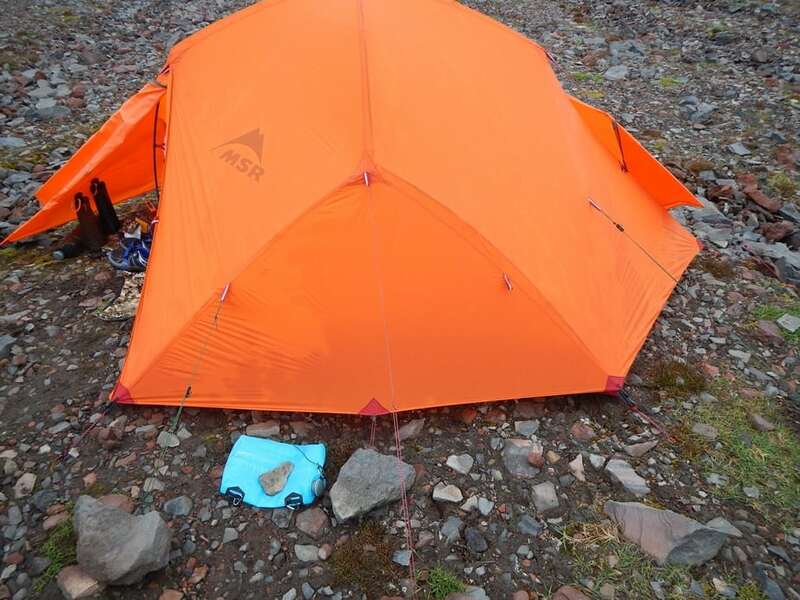 Another minor complaint is that one of our testers is 6’5” and struggles with his feet pressing against the end of most tents; the MSR Access 3 was no exception to that issue. We have yet to find a tent that really fits someone of that height. Overall, we are happy with the MSR Access 3 (link here). It’s most important features are that it is durable but lightweight. With two doors and two vestibules, and plenty of room, it serves a party of two hunters well. Of the negatives, most issues are easily fixed by adding the extra guylines, which are easy to find and purchase. The additional guylines added ~6 ounces to the overall weight of the tent. The other negative MSR could easily fix is to add Velcro loops to the rainfly to keep it centered on the tent and keep the vestibule from sagging. Our plan is to keep running the tent for future sheep hunts and late season backpacking. Our next challenge is finding the right one man tent to accommodate a potential party of three.